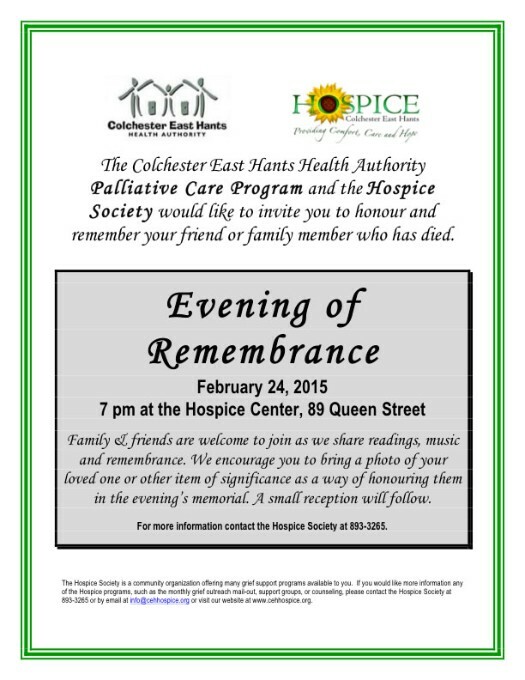 The Colchester East Hants Health Authority Palliative Care Program and the Hospice Society would like to invite you to honour and remember your friend or family member who has died. Evening of Remembrance February 24, 2015 7 pm at the Hospice Center, 89 Queen Street Family & friends are welcome to join as we share readings, music and remembrance. We encourage you to bring a photo of your loved one or other item of significance as a way of honouring them in the evening’s memorial. A small reception will follow. For more information contact the Hospice Society at 893-3265. The Hospice Society is a community organization offering many grief support programs available to you. If you would like more information any of the Hospice programs, such as the monthly grief outreach mail-out, support groups, or counseling, please contact the Hospice Society at 893-3265 or by email at info@cehhospice.org or visit our website at www.cehhospice.org.